The term stranding refers to an aquatic animal observed in an inappropriate location, for example, an offshore species found inshore. Most often, stranded animals are found on a beach or in shallow water. Observations as far back as AristotleAristotle. (1910). The History of Animals. (D. W. Thompson, Trans.). London: Clarendon Press. and illustrations from the Middle Ages show us that marine mammals have been stranding for millennia. There are many causes of strandings, such as disease, ship-strike, injuries, storms, and entanglement. Only very few strandings have been attributed to sound. 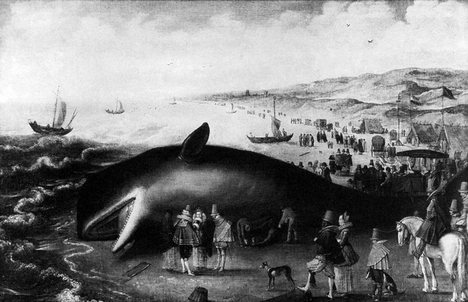 Drawing of a stranded whale in Katwijk, the Netherlands, in 1598. Image courtesy of World News Network. In the U.S. alone, about 1,000 cetaceans and 2,500 pinnipeds strand annually. Some animals strand live and are returned to sea. Others die at sea or on shore. Animals may strand singly or in groups. When 3 or more animals strand together in time and place, it is called a mass stranding. Some species, such as pilot whales, mass strand regularly around the world. Determining the cause of a stranding or death of a stranded animal can be difficult. Dead stranded animals are sometimes necropsied which is a thorough examination of the entire body. Scientists usually have little or no information about the animal’s history or the circumstances that preceded the stranding. A cause of death can be determined in only about half of all stranding cases. 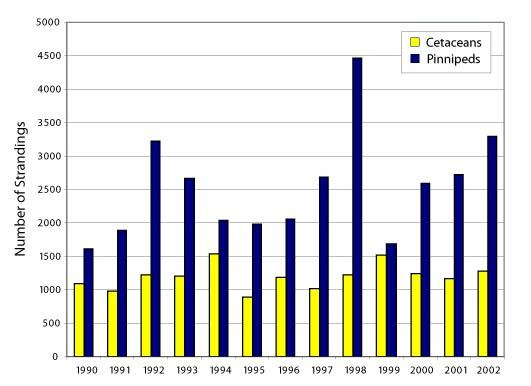 Total number of strandings of cetaceans (yellow bars) and pinnipeds (blue bars) in the U.S. each year from 1992-2002. Data provided by Janet E. Whaley and Teri K. Rowles, NOAA Marine Mammal Health and Stranding Response Program. There is consensus that military sonar exercises have contributed to mass strandings of beaked whalesFiladelfo, R., Mintz, J., Michlovich, E., D’Amico, A., Tyack, P. L., & Ketten, D. R. (2009). Correlating military sonar use with beaked whale mass strandings: What do the historical data show? Aquatic Mammals, 35(4), 435–444. https://doi.org/10.1578/AM.35.4.2009.435D’Amico, A., Gisiner, R. C., Ketten, D. R., Hammock, J. A., Johnson, C., Tyack, P. L., & Mead, J. (2009). Beaked whale strandings and naval exercises. Aquatic Mammals, 35(4), 452–472. https://doi.org/10.1578/AM.35.4.2009.452National Research Council (U.S.) (Ed.). (2003). Ocean noise and marine mammals. Washington, D.C: National Academies Press.Evans, D. L., & England, G. R. (2001). Joint Interim Report Bahamas Marine Mammal Stranding Event 15-16 March 2000. Washington, D.C.: Department of the Navy and Department of Commerce, National Oceanic and Atmospheric Administration. PDF. However, it is still not clear if it is simply the sound of the sonar , or other aspects of the military exercises, such as multiple ship maneuvers, that resulted in the strandings. Mass strandings of beaked whales are rare, with only 136 mass stranding events reported from 1874 to 2004D’Amico, A., Gisiner, R. C., Ketten, D. R., Hammock, J. A., Johnson, C., Tyack, P. L., & Mead, J. (2009). Beaked whale strandings and naval exercises. Aquatic Mammals, 35(4), 452–472. https://doi.org/10.1578/AM.35.4.2009.452. Of these, two reported details on the use, timing, and location of sonar in relation to mass strandings. Ten other mass strandings coincided in space and time with naval activity that may have included military sonar. As of 2014, there are five additional documented events of beaked whale stranding in association with military sonar exercisesKetten, D. R. (2014). Sonars and strandings: Are beaked whales the aquatic acoustic canary? Acoustics Today, 10(3), 46–56.. All these events had three consistent features: (1) the stranding locations were less than 80 km from the 1,000-m depth contour (that is, where deep water occurs near shore); (2) they occurred in areas where beaked whale mass strandings had previously been reported; and (3) all included Cuvier’s beaked whales, a species that does not commonly mass strand. Although these beaked whale strandings were closely related in time and location to the use of military sonars by many nations, whether the sonar sounds caused the strandings has still not been determined. In five well-documented cases, there is sufficient information about the military exercises and the times and locations of the strandings to determine that multi-ship exercises with sonar contributed to the strandings. These events occurred in Greece (1996), Bahamas (2000), Madeira, Portugal (May 2000), and the Canary Islands (2002 and 2004). The necropsies that were performed (described below) found similar injuries, but none of the animals were found to have acoustic trauma. There are currently few peer-reviewed scientific publications that describe and discuss these strandings. The majority of authoritative information on these strandings can be found in official investigation reports of the events. 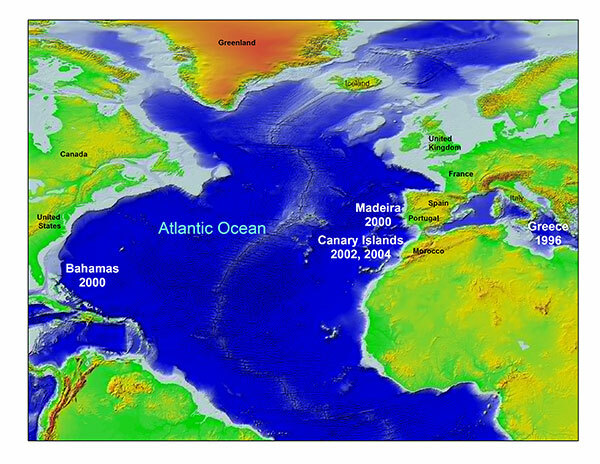 Locations of the five best-documented beaked whale strandings that coincided with military activities involving the use of sonars. Two minke whales also stranded during the incident in the Bahamas in 2000. Additional details about standing events can be found on the DOSITS Marine Mammal Stranding page. Cox, T. M., Ragen, T. J., Read, A. J., Vos, E., Baird, R. W., Balcomb, K., … Benner, L. (2006). Understanding the impacts of anthropogenic sound on beaked whales. The Journal of Cetacean Research and Management, 7(3), 177–187. 1. ↑ Aristotle. (1910). The History of Animals. (D. W. Thompson, Trans.). London: Clarendon Press. 4. ↑ National Research Council (U.S.) (Ed.). (2003). Ocean noise and marine mammals. Washington, D.C: National Academies Press. 7. ↑ Ketten, D. R. (2014). Sonars and strandings: Are beaked whales the aquatic acoustic canary? Acoustics Today, 10(3), 46–56.